Male giraffe fights are called "necking": giraffes use only their necks and ossicones as weapons in combat. The contenders never resort to kicks or bites, weapons instead use against predators. This behavior is used to establish dominance in order to have greater reproductive success. A fight starts with a head to head posture and can have a low or an high intensity. In the first case the giraffes rub against each other. A male wins when it can hold itself more erect. 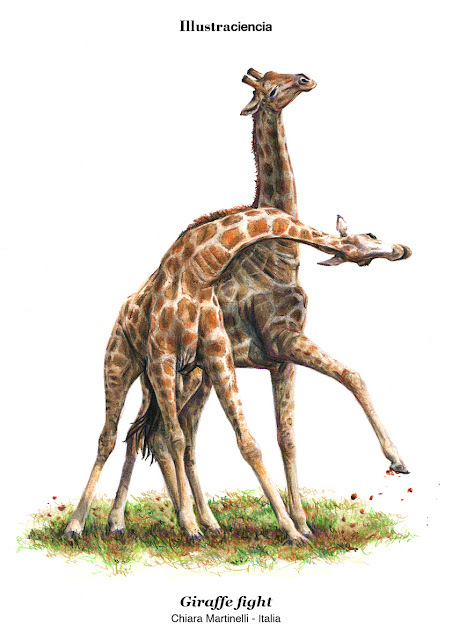 During an high intensity necking male giraffes take a head to tail posture, spread their front legs and swing hard their necks at each other, attempting to land blows with their ossicones. The power of a blow depends on the weight of the skull and the arc of the swing. The dispute ended usually with the flight of one of the fighters. Usually most fights do not lead to serious injury (most of the shots not reach the target), but there have been cases of broken jaws, broken necks, and even deaths.